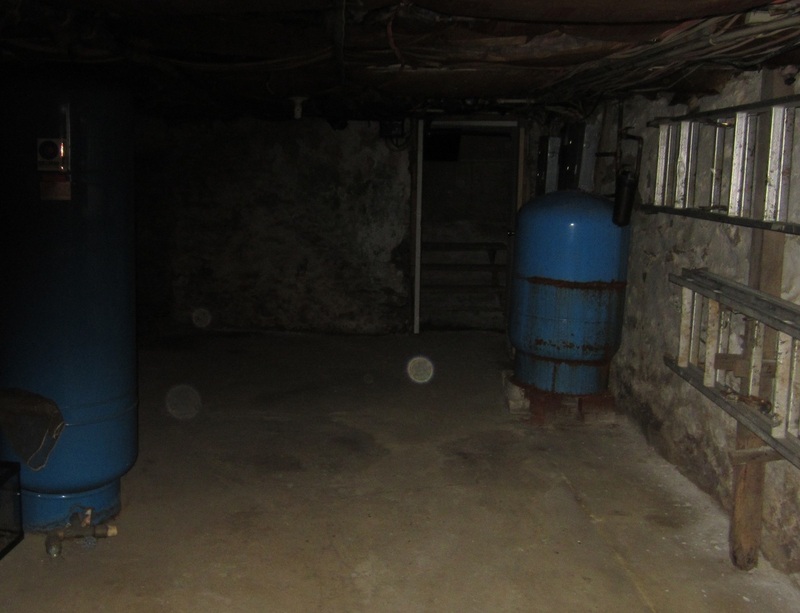 In my previous article I was fascinated by some images captured on camera of what appear to be either “Dust Motes,” (as photographers call them,) or “Orbs,” (which ghost hunters call them,) in a underground coal bunker at a very old, uninhabited local farmhouse. 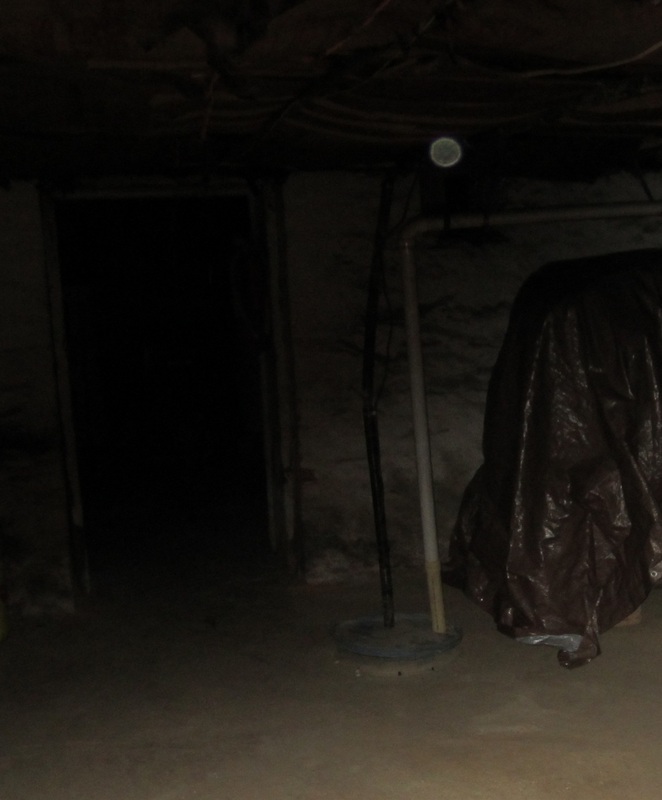 I had mentioned that having taken many pictures in the older farmhouse that I live in, that I’ve experienced none of this phenomena. Having my curiosity piqued by what had appeared in the coal bunker, I decided to try an experiment here at home to see if anything similar would occur. I was in for quite a surprise and even crashed a party. April 15th, Early Evening Basement Test Shots. I decided to go down to my basement and, with the door closed and in total pitch blackness, see what I might capture with my digital camera, (Canon Power Shot ELPH 300.) This was the same camera I had used in the underground coal bunker and it was set on “Automatic,” with the flash set to go off if needed. This camera is fully functional and the lens is clean. I will note here that all pictures taken and shown here are not altered in any way. I simply either downsized and cropped only to center and detail observations. A view of the basement standing just inside the closed door and looking right. Very typical old stone walls, coated with horsehair plaster and whitewashed long ago. But in the upper center, just to the left under an angled pipe, there is something interesting; no, not just one, but two. Dust motes? They are not a double reflection as each is anything but identical. 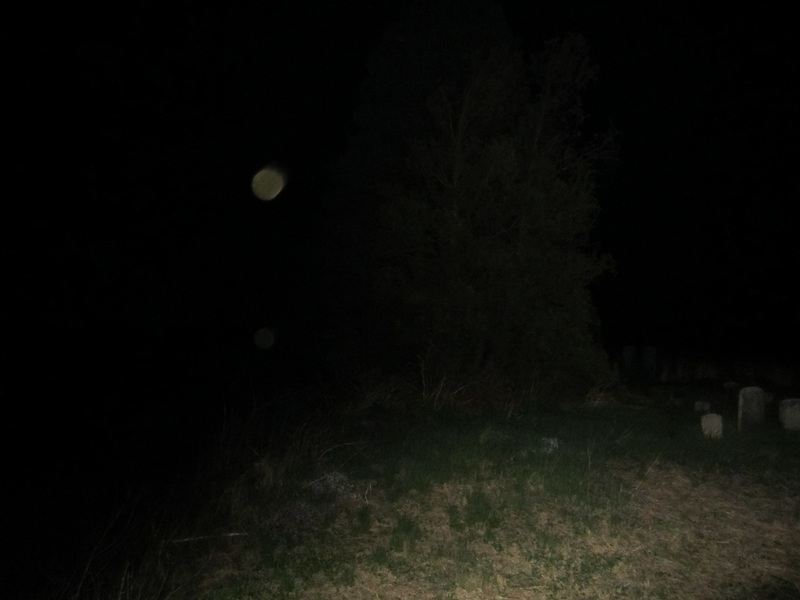 The more visible one is an aqua blue and from the distance of approximately 10 feet or more, it appears to be about the size of a tennis ball. Shown below is a close cropped detailed view. Interesting that one seems to catch light and give off color and the other one remains transparent. And, the question keeps coming back to me: How can a mere dust mote be so large from a distance? 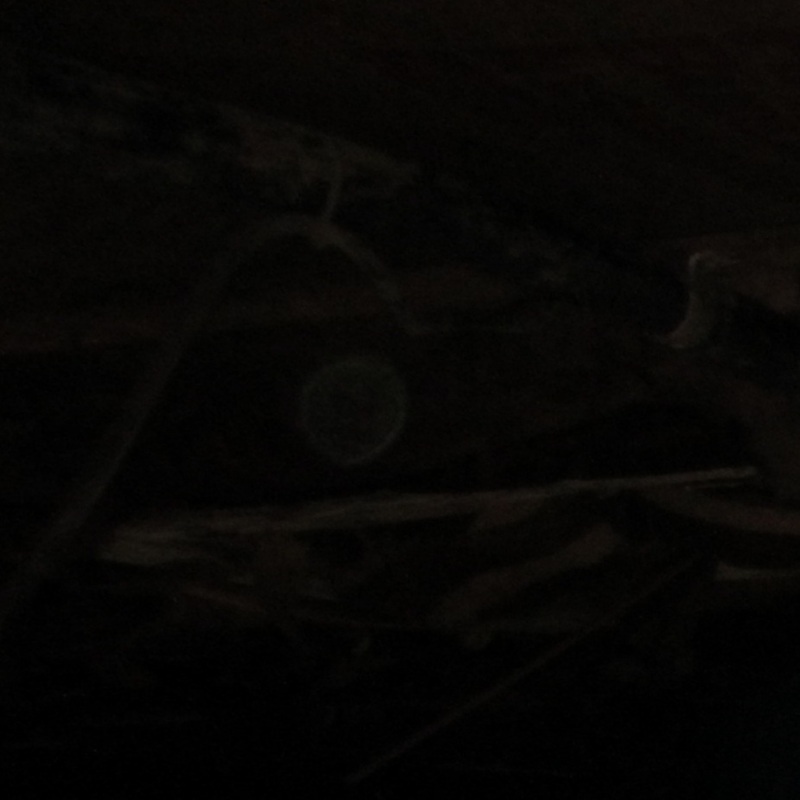 I walked about in the dark and took some more pictures and happened to catch this, what appears to be nothing but another dust mote floating up near the ceiling, upper left in picture below. Below is a closer cropped detailed view. Note this “Mote” has what appears to be facial features. (And it doesn’t look happy either.) I was very curious about these things and wondered what the next step should be. Wouldn’t there be more than just one or two appearing if these are dust? And again, the large size of these intrigued me. 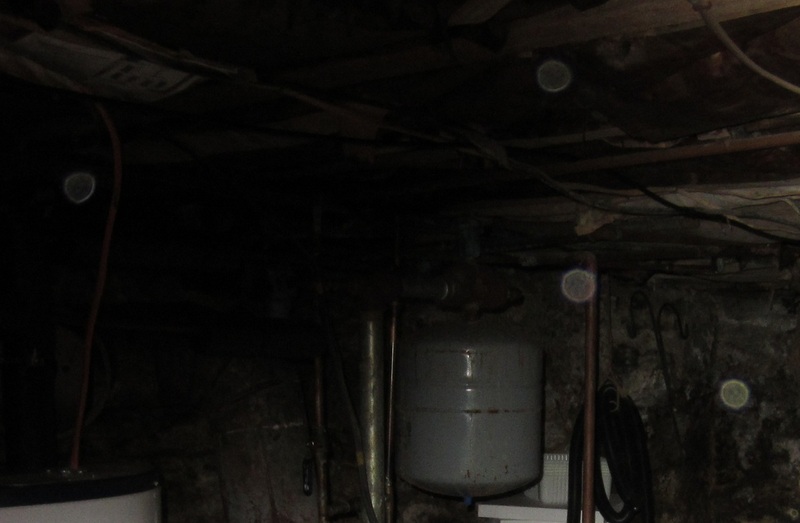 These anomalies did not show up in every photograph, although I did not spend much time in the dark basement that evening. It was a bit spooky, even for a logical minded person. I had simply gone down for a few quick test shots. None of these things were visible to my eyes. I had no way of knowing if I was capturing anything until I put the memory card into my computer. 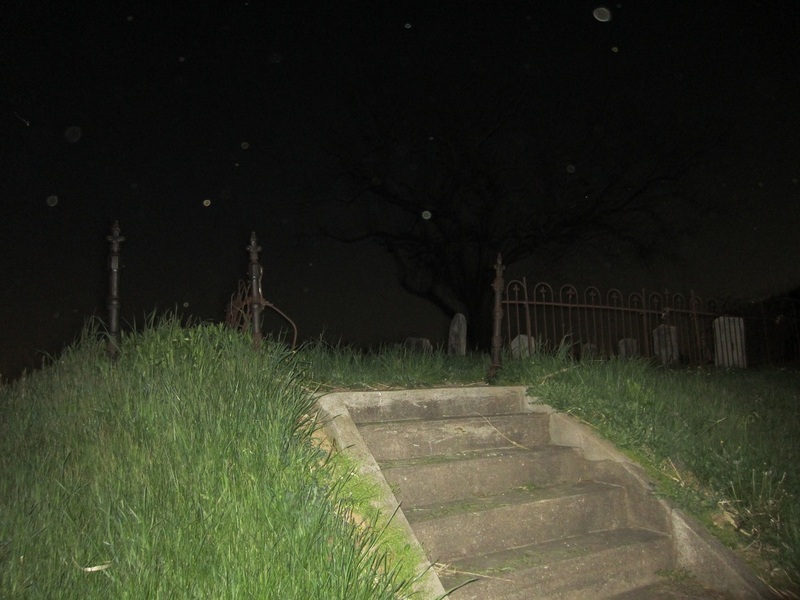 After seeing the quick test shots, I was thinking of a more involved evening spent, not only here taking some shots in my basement, but I was also having thoughts about the cemetery at the top of the hill. 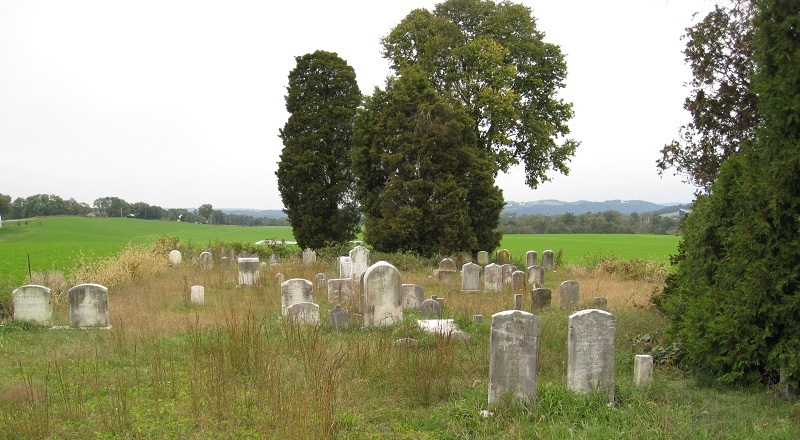 The hilltop cemetery dates back to the late 18th Century, and five of the previous owners of this old farmhouse are buried there. 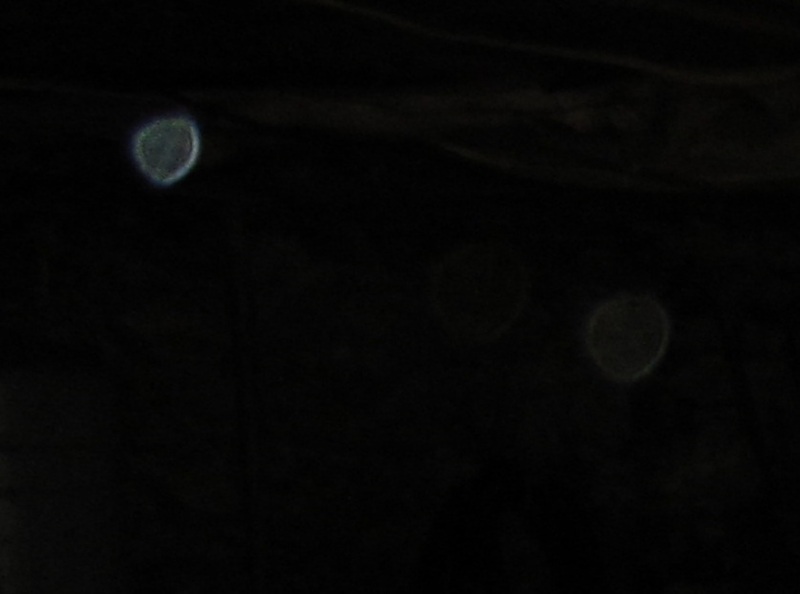 Being logical and open minded, I planned to see what these “Dust Motes,” “Orbs,” or “Spheres” were all about. 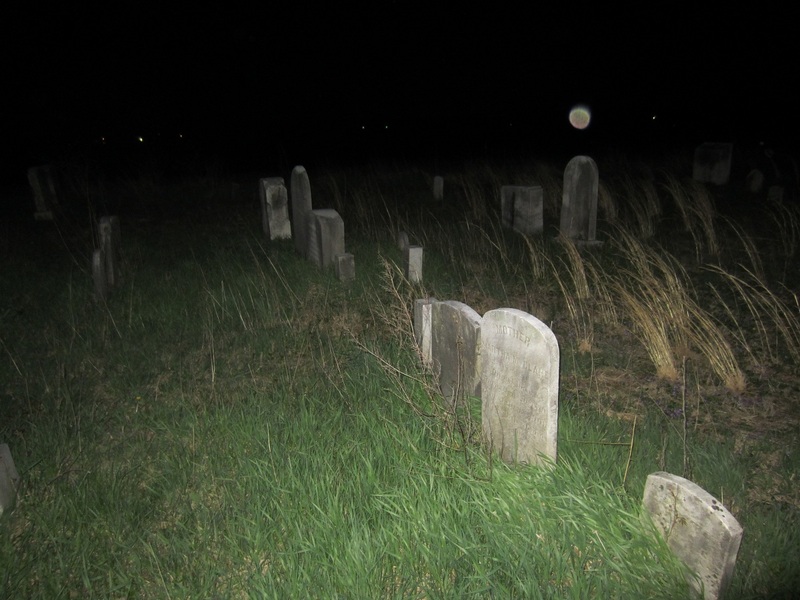 I also must admit that having watched those “Ghost Hunter” shows in the past, this type of “exploring” looked like fun and definitely appealed to me. 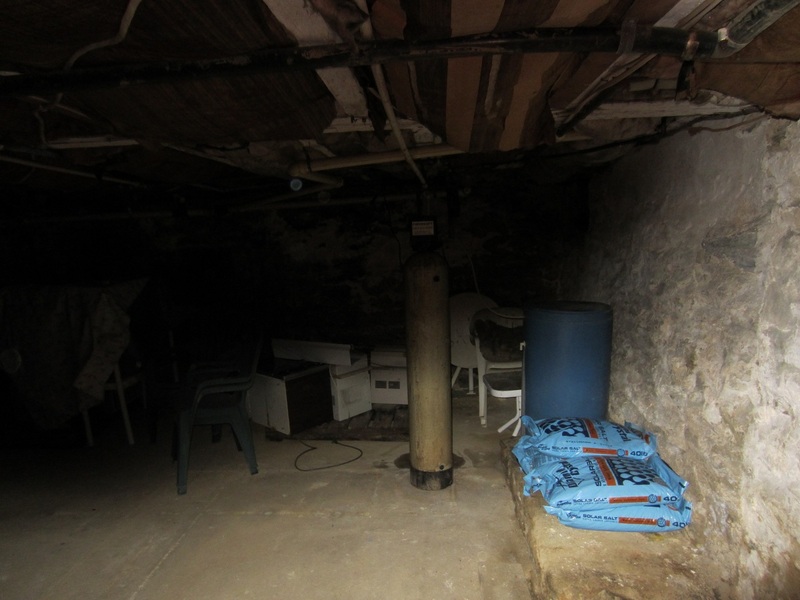 I started in the basement again with a more thorough approach. This time I wanted to shoot two or three pictures of the same spot and see if whatever showed up, would show up in all of them. This proved difficult as I found out in my attempts that the camera took a few seconds to refocus again in the dark, so there was a time lapse. I don’t know if my camera has the auto rapid fire exposure setting and I was already down in the dark. What you’ll see is exactly what my camera saw. The last time I did this, it was early evening and still daylight outside. This time, dark at night, made it a bit more interesting and a bit scary. I started just snapping away, the above shot I had taken just walking into the basement. This one is rather bright as it reflects the light of the flash. Below is a detailed view. It’s always nice to know that there’s not alot of dust in my basement, just a large mote here and there. Again, why just one and not many? Ahh, yes. Here in the back (newer 1800’s) addition, there’s a whole “Dust Party” going on. The only question; was I invited? No worries, I was crashing this party anyway. There are half a dozen or more here in varying degrees of transparency, note the one upper left, it not only shows bright aqua blue, it appears as if it’s a side view and it has a “blunted” area in the direction it’s moving. Most curiously, it also looks like it has a ring around it. This photograph was taken just before the other one, as the “ringed” sphere is closer to the hot water heater and moving downward to my right. 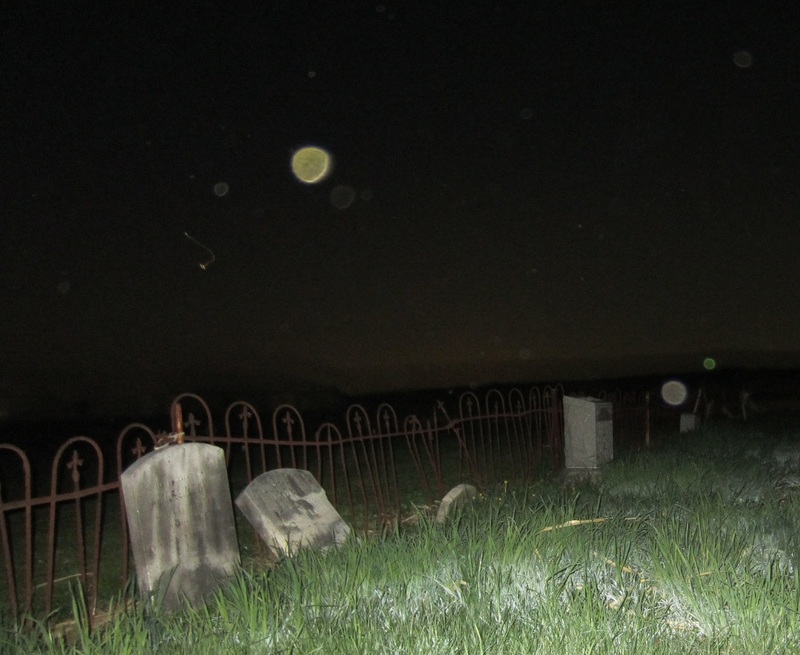 This is quite the dust mote or ghost party; they look like they’re dancin’ in the air. I had taken 233 photographs that evening and though not all showed something, a good third of them did. I then chose the best ones to show here. There are many pictures that show these that I did not include for the sake of redundancy. A closer look at a dusty party, or is it? I wonder what kind of music they like? Looking back towards the door I had left open. It looks as if some are either coming or going from the party. Maybe it’s like a clique that develops at a party and they only wanted to talk to each other. Note these three seem to be a level, perfect triangular distance from one another. I find the chaotic randomness of dust motes forming this pattern interesting. Interrupting the triangular clique, I then discovered the whole party had moved to the older room with me. 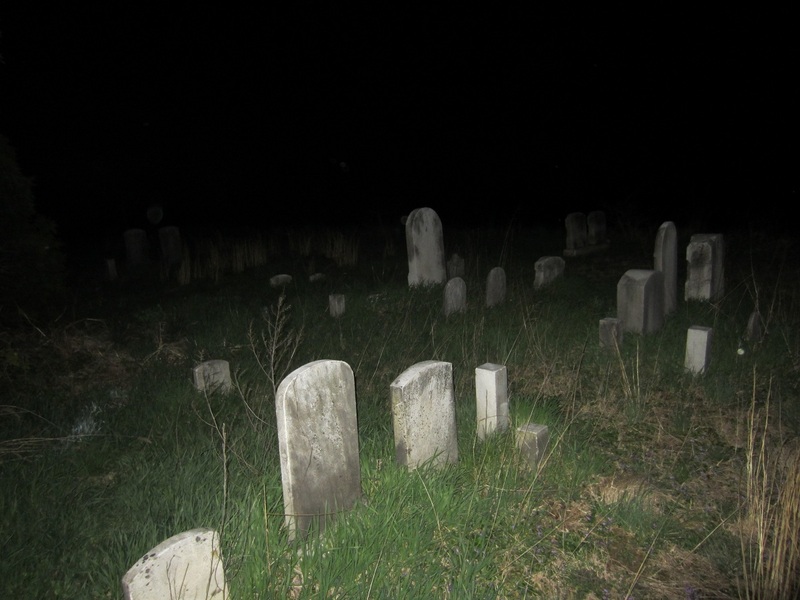 Maybe I was popular, but even so, I decided to leave this party and see what was goin’ on uphill at the cemetery. If they’re still partying down there, I can’t hear it. Now it was time for a walk up the hill. It’s necessary to note the weather conditions as this, I feel, is very important. The official local forecast that evening was a 10 miles per hour northwest wind, the temperature was 38 degrees, the humidity was 51% and the moon was at half mast. Leaving the basement doors I walked a bit uphill along the paved small road behind the farmhouse. Out of curiosity, (or strange suspicion,) I turned around and snapped a photograph behind me. Now I was heading up the small road. The light near center is from a home pretty far away, but note what’s to the right of it, almost dead center of the road. Was this an invite to another party? 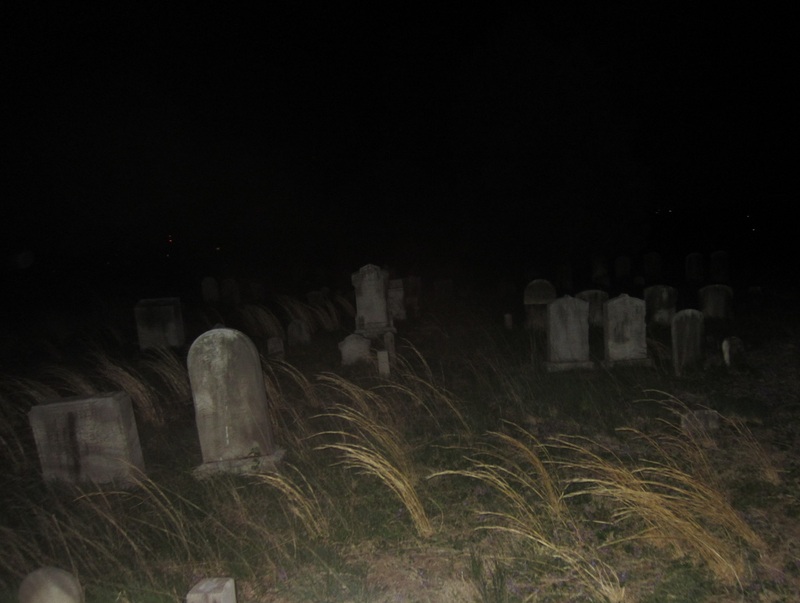 Not far from that spot, I would make a left turn into the cornfields and walk about 8 minutes to the cemetery. The above picture intrigues me, note how far away the sphere is, and keep in mind that the wind was constant, at the very least 10 miles per hour. 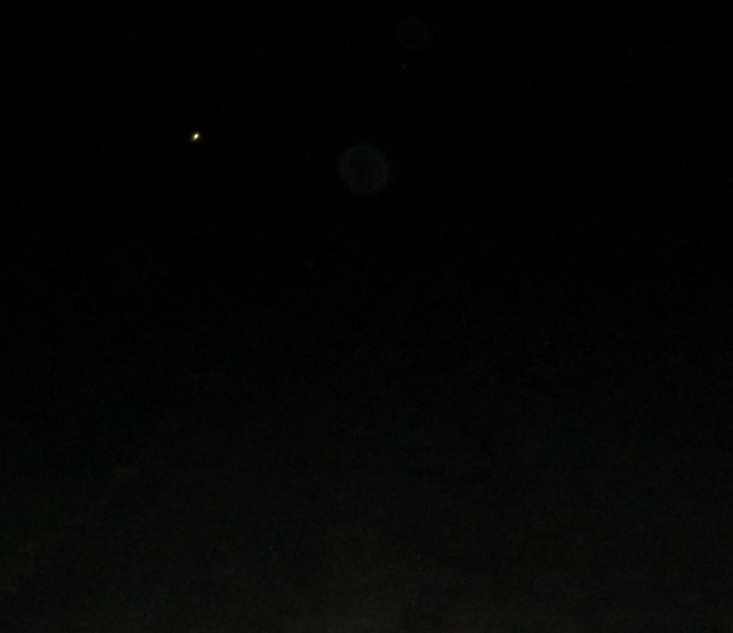 Below is a cropped close up of the sphere in the road. A very beautiful scene of rolling hills and quite a peaceful resting place. 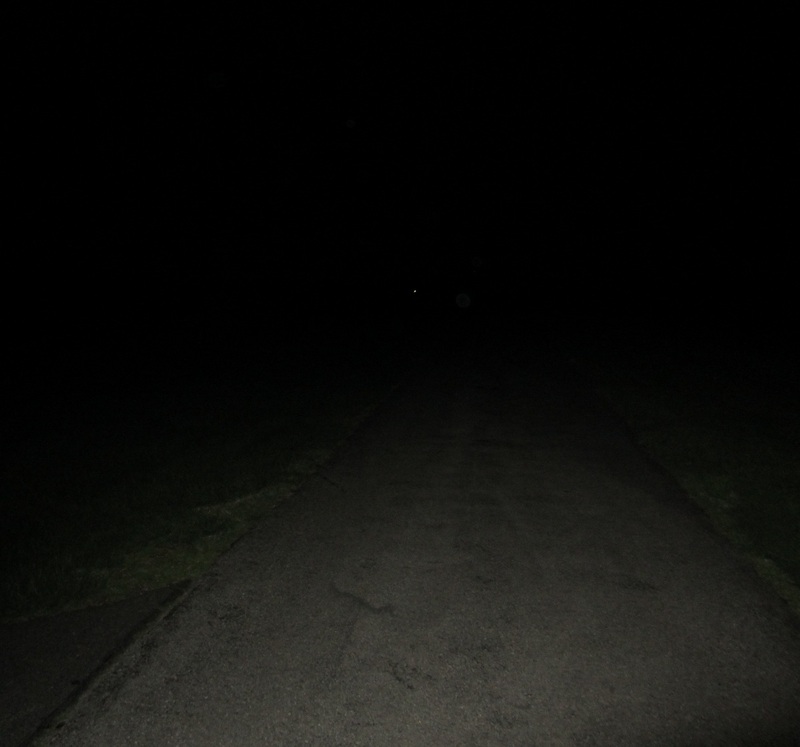 At night, it may still be peaceful, but to me, it was a tad unnerving. I had originally planned for my friend Dave to come up here with me, but due to family obligations, he couldn’t make it. I was going by myself alone at night. 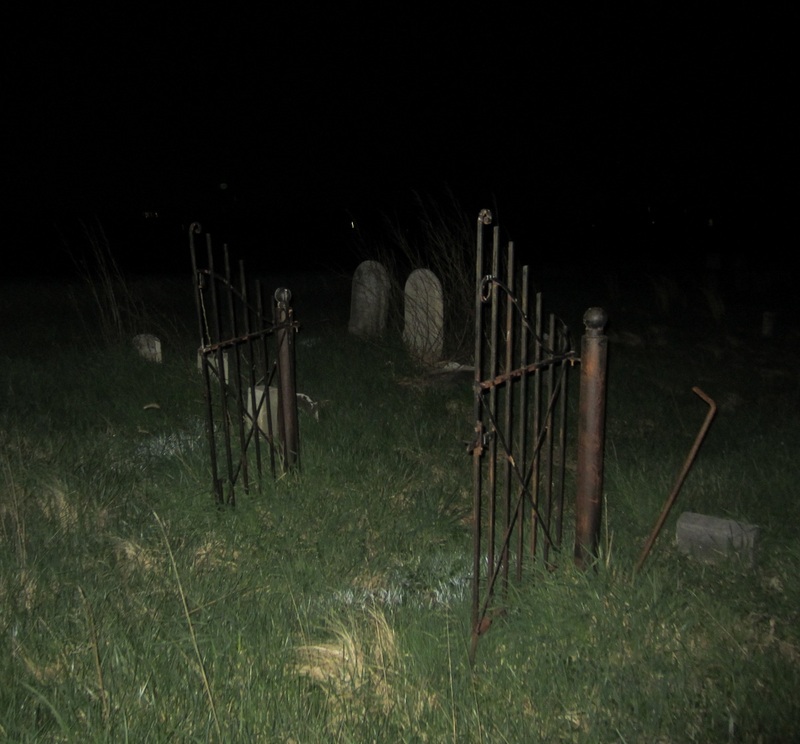 Arriving at the old gates to the cemetery, I began taking pictures. For what appeared in them, I have absolutely no explanation. 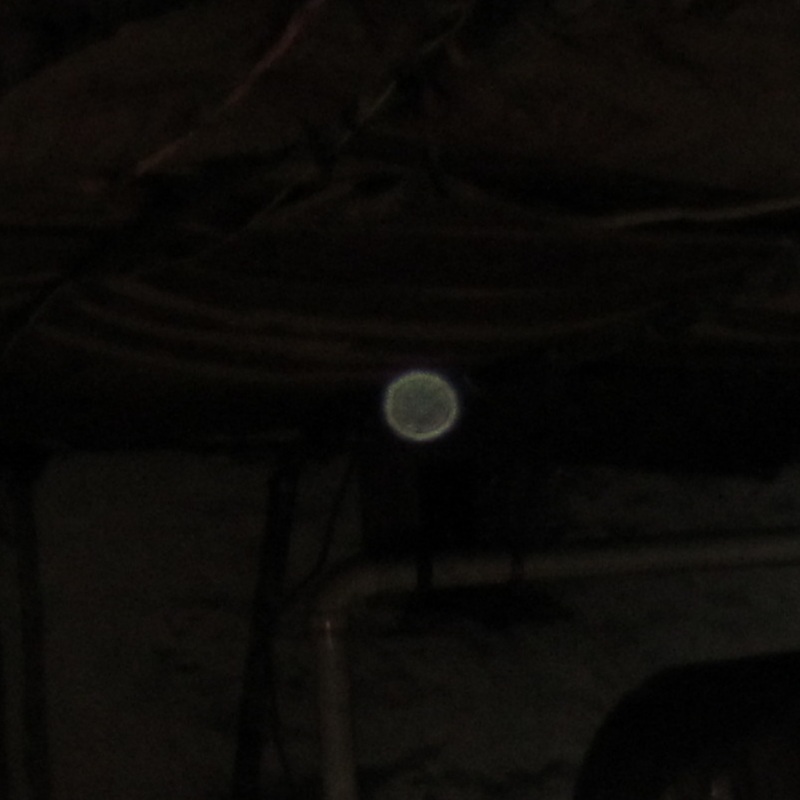 Some “anomalies” appear just as the ones in the basement, others are much brighter and solid, causing me to be unsure if these are just dust motes. And remember, the wind was blowing too. This shows more than just the gates; just above the left gate and a bit further off is one. Of course it’s easy to define the lights off in the distance. 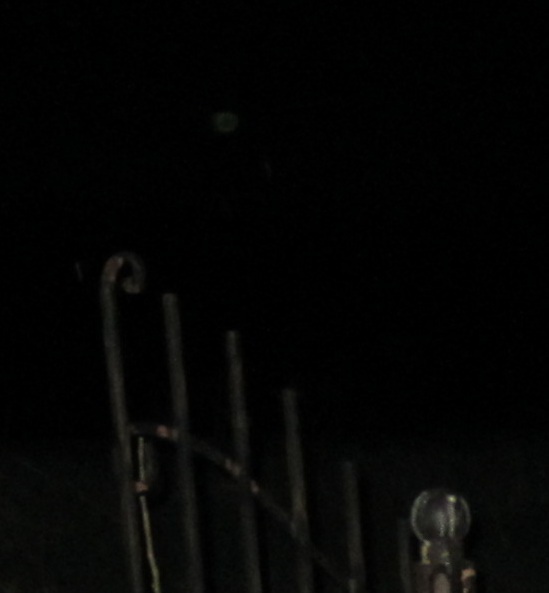 Below is a closer crop of the picture. I saw nothing unsual with my eyes during the time I was there. 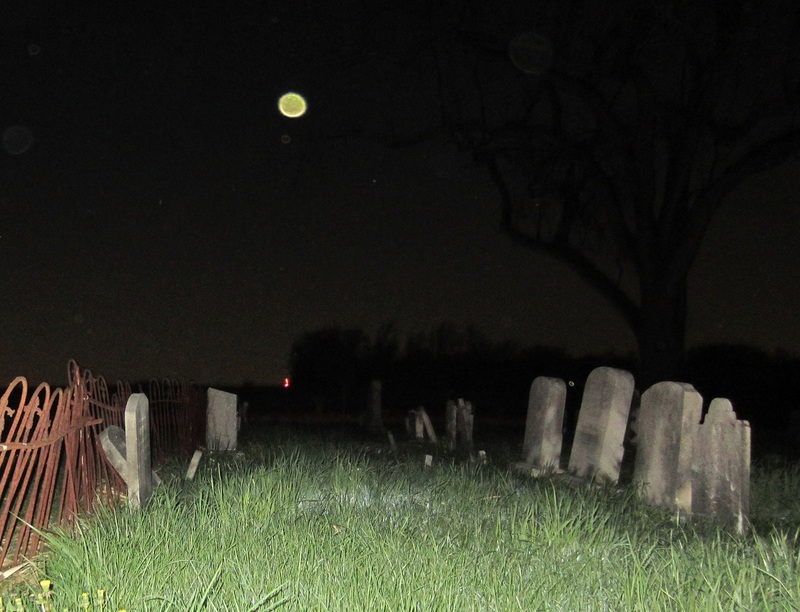 I simply walked through this late 18th Century cemetery taking pictures. 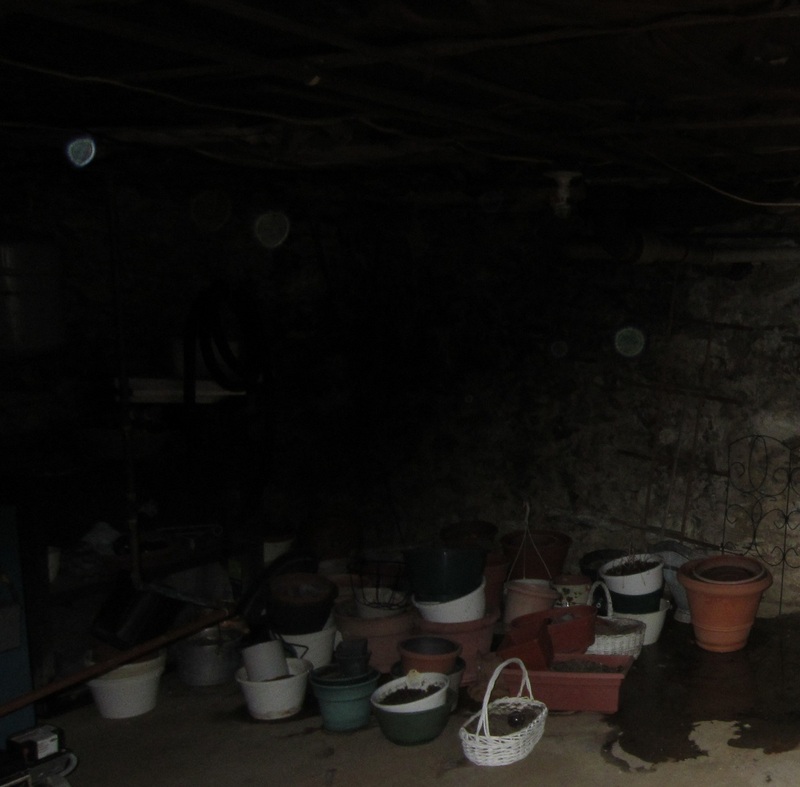 The total time I spent taking pictures in the basement and cemetery was just shy of an hour. Below is a photograph in which there’s a object to the very far left, and it illustrates the constant wind. I’m facing west and halfway inside the cemetery. Just what are these, especially with the wind blowing? This time I’m facing east and the wind is coming from my left. There’s one very close and at far left, but it’s not bright. 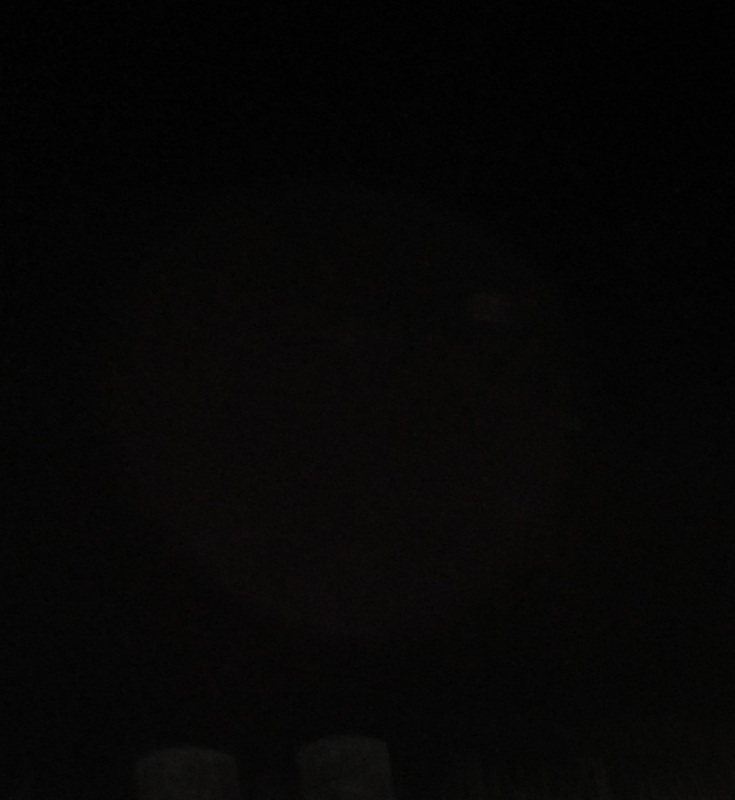 The very bright glowing ones are a bit of a distance away, at least 30 feet. Below is a closer detailed view. Both objects are moving in (or against) a 10 mile per hour wind. Note the top one almost looks like a comet with a shorter “tail.” This is making me rethink the whole “Dust mote” theory. Interesting that these are “traveling” in a pair. Would the objects have contrails, or a tail if they were not resisting or moving against the wind? Interesting. This is another, not as bright, though closer, has no motion effects. It appears to be just hovering, or just blowing by in the wind, I can’t tell which. Below a detailed look at it. This is a pretty good sized one, a closer look shows some motion to one side of it. 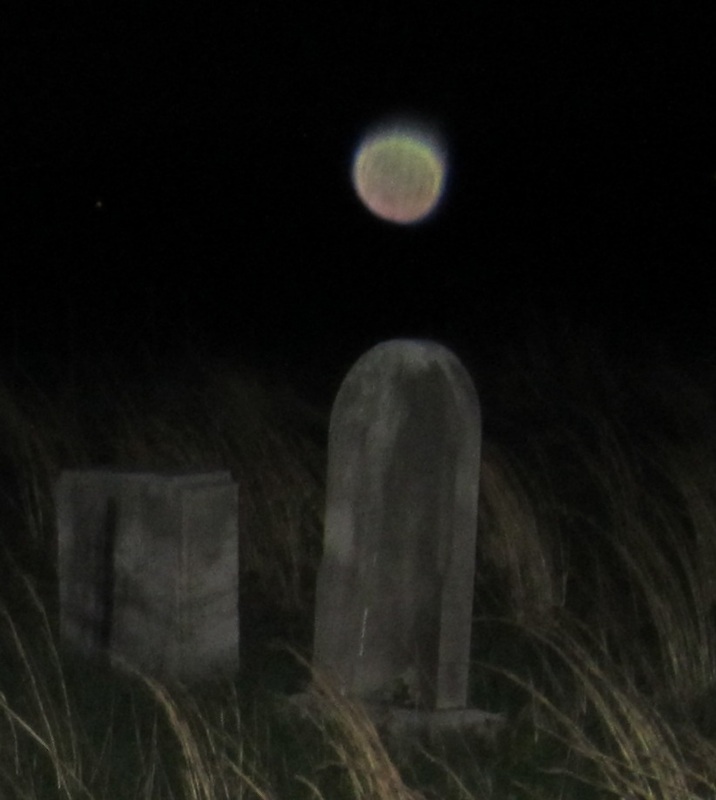 The above photo shows one in the air, another just on, or hovering over a headstone. This is getting more interesting, see above a closer detail of these two. There’s four I can see in the above photo, all are “doing their own thing.” Below are two detail shots of these. The below photograph is very interesting for two reasons. 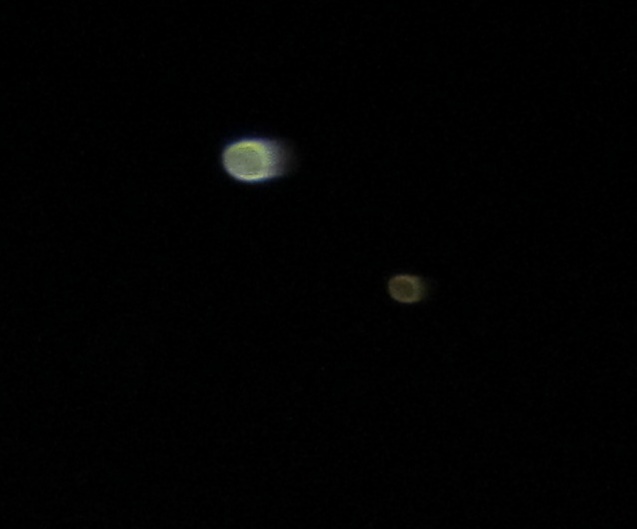 One, note how one of these spheres is moving, whether on its own, or with the wind and the other is quite stationary. Two, what is the reason for the very dark shadow to the left of me? What appears to be a dark cliff or dropoff is simply not there. For some inexplicable reason, the flash of my camera is “muted” on that side. The one featured below is the only one I knew I had caught on my camera before coming back to the farmhouse. Right after taking the picture, the camera shows the photo in the back viewfinder for a moment. It was so bright, even in that quick moment in the small view lens, I couldn’t miss it. There are, of course, distant lights in the background looking towards the south. What’s so hard to explain, is this anomalie is moving against the wind. If were just a dust mote blowing throught the air, wouldn’t the “trails” emanating from it be either nonexistent, or in the same direction as the wind? 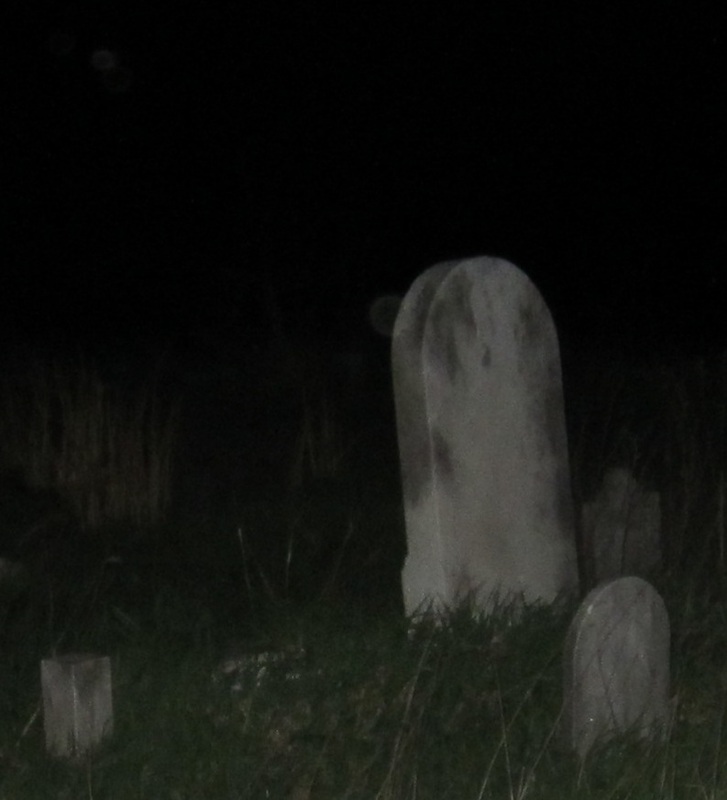 The is clearly moving downward towards the headstone against the wind, which is clearly evident by the bend of the grass. This picture really fascinates me. Below is a closer view. Note the colors in the object. 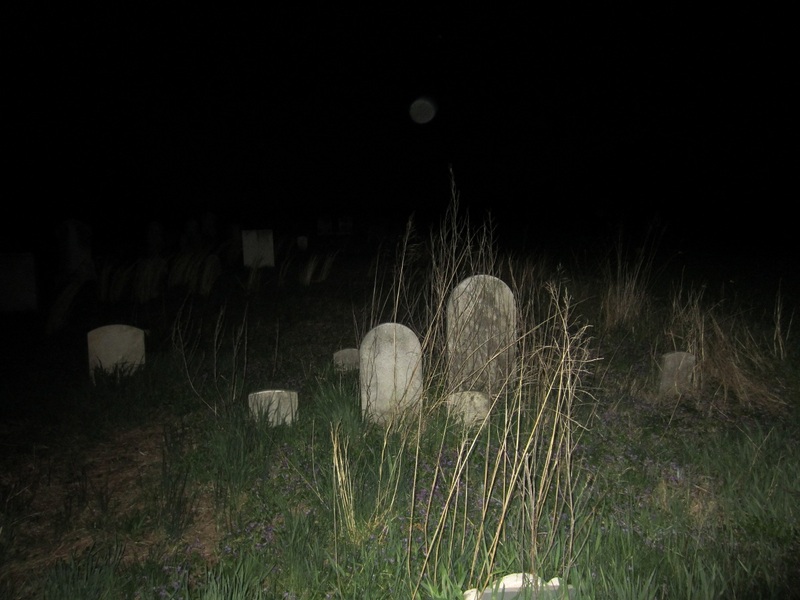 If the above photograph isn’t enough, I thought the next picture below was one of the most eerie of all. Look above and to the left, you can’t possibly miss it. A very large, size of a volleyball object with what appears to be “eyes.” This was no further than 3 feet from my head. Below is a cropped, closer detailed view. 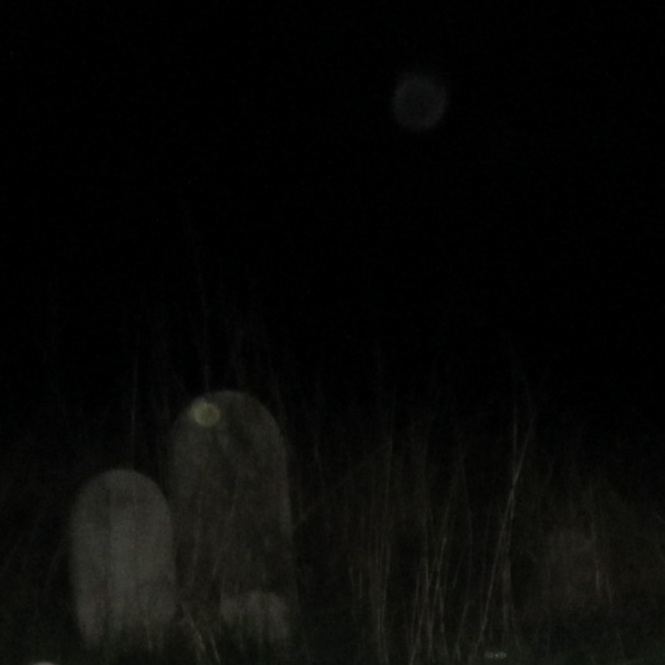 The “eyes” are not tombstones in the background, this is hovering well above those. I’m having a hard time believing this is a mere “Dust Mote,” but I really don’t know what to think. Whatever these objects are, they are fascinating and make the mind wonder. So what are these anomalies? Ghosts? Here’s where the story was to end. But as it turned out, this was not to be the case at all. Sunday, April 21st. Early Afternoon. I was intent on writing this article Sunday, as I had all I needed to prove a point or not, or simply raise some questions as I suppose I definitely did. But an interesting opportunity arose when my landlord stopped by Sunday afternoon and said he was going to drain the well in front of my porch. 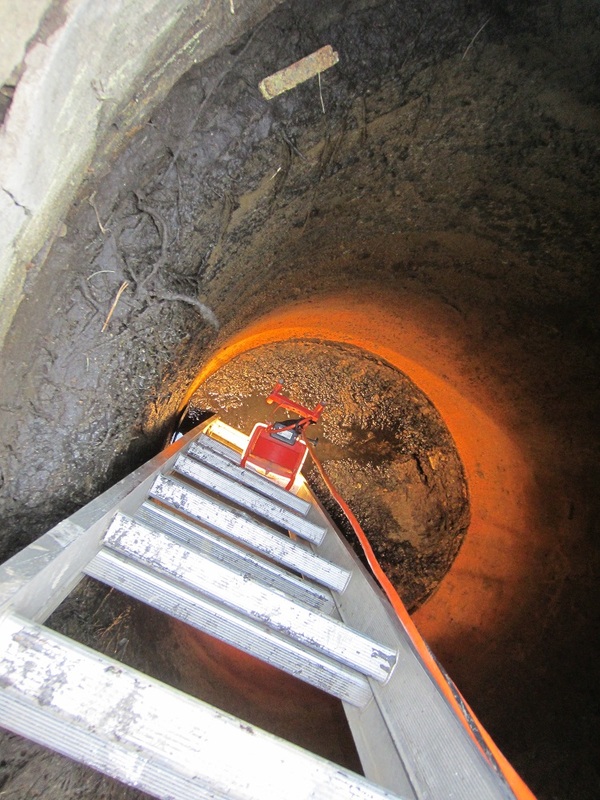 He wanted to run a new overflow drainage line to the storm grate along the road from near the top of the well. 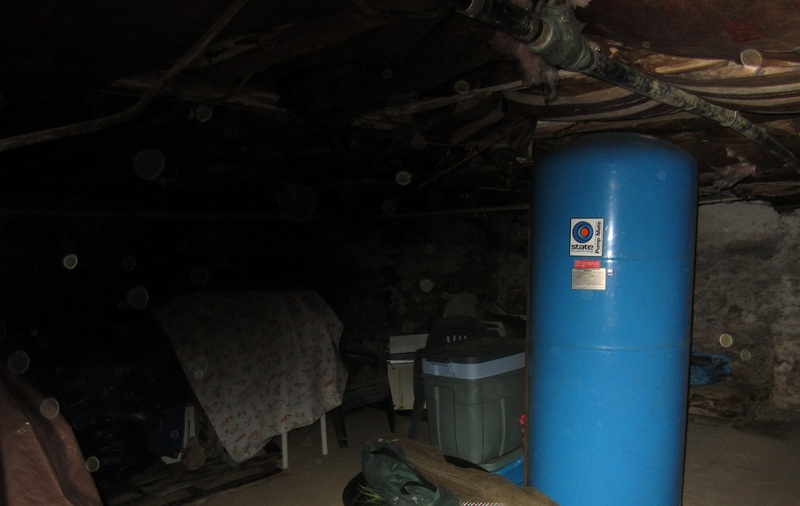 The well is the original one dug back in the late 1700’s and is covered over with a concrete slab cast long ago. 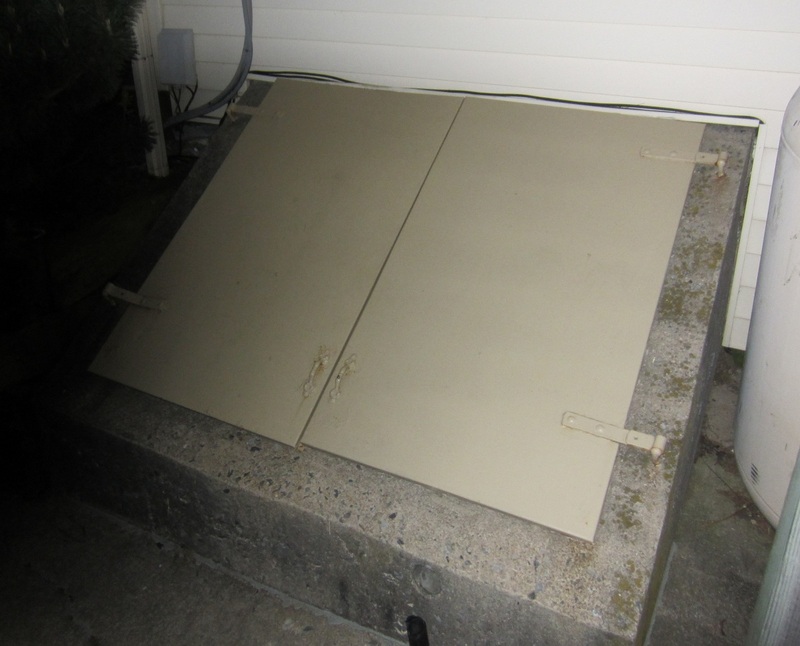 There’s a square metal plate with a ring pull that lifts it like one would lift a manhole and you can see down in there. Out of curiousity I have lifted it in the past and have seen only dark water and top surrounding bricks and always wondered what had been tossed down there, and how deep it was, and if there was ever a way to find out what’s at the bottom. Valuable bottles? Artifacts? Anything old and cool? My landlord told me it would take only 15 minutes to pump the water out and if I wanted to check it out for artifacts and bottles, now was my chance. I have the coolest landlord one could ever have. 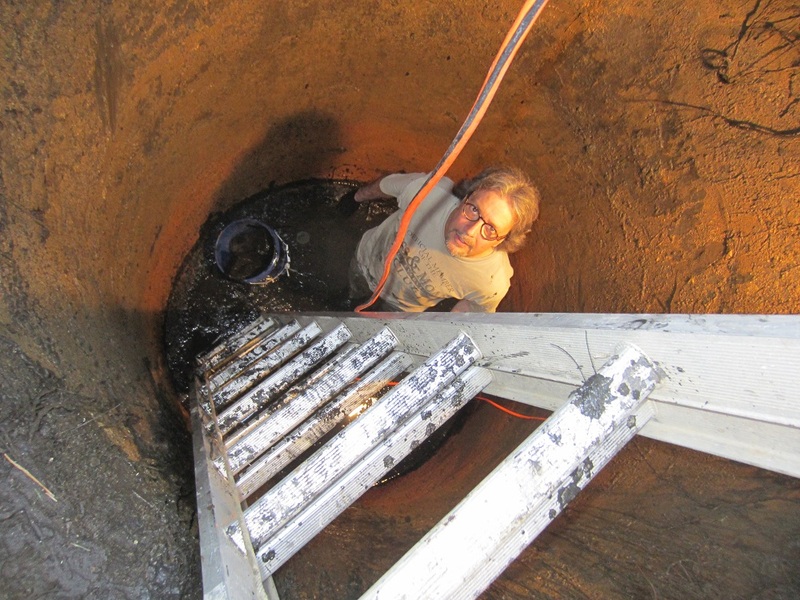 He thought it was the original well, some 40 feet deep, but we were both surprised by what it turned out to be. 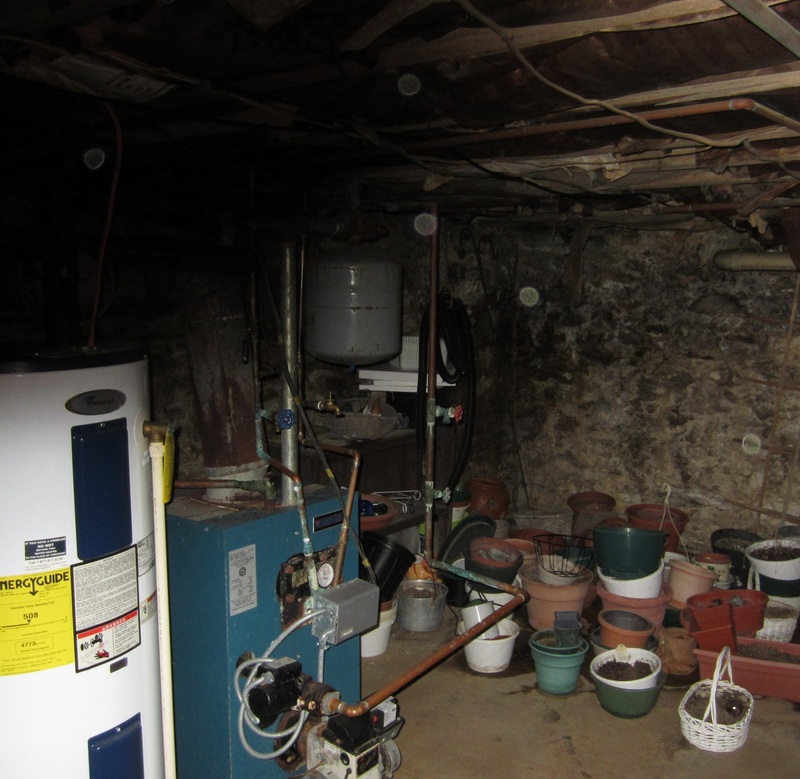 The original well, once pumped out turned out to be a cistern; the well having been capped at a 15 foot level, was now a round tank some 5 feet diameter with the old stone walls covered in stucco; no telling how many years ago this change occured. Looking down the cistern at the remaining swampy muck at the bottom was a bottle and artifact lover’s dream. 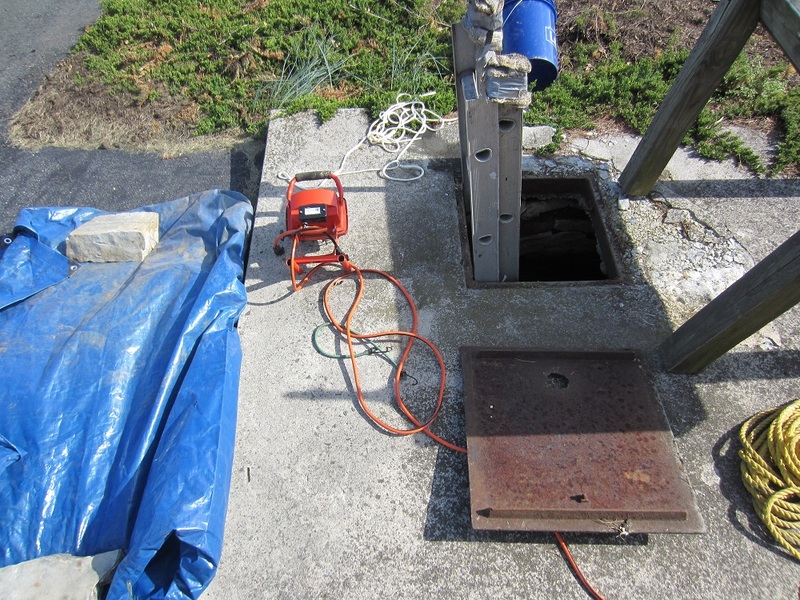 I had all my tools and ladder already down into the cistern and was rarin’ to go. 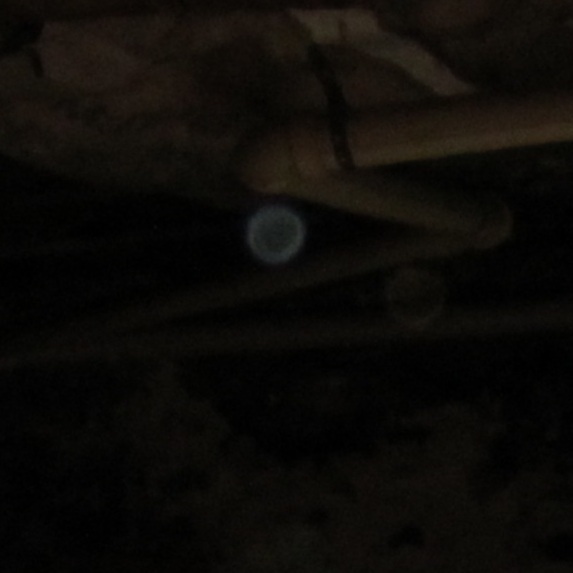 Here’s a flash photograph looking down into the cistern before I lowered a very powerful light into it. I was dreaming of bottles down there in the muck, the ladder hit solid ground about a foot below the muck, and I thought there’s gotta be something cool down there. 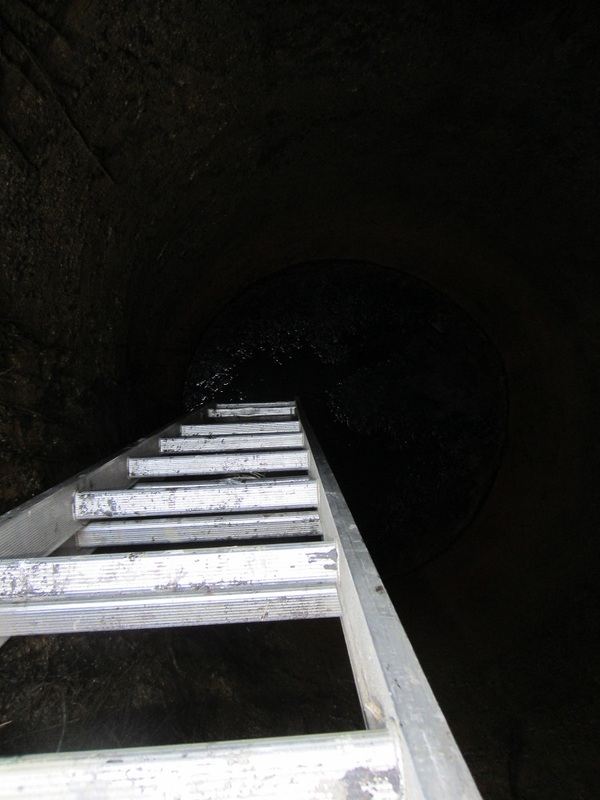 The water level was above what you see at the top, the cistern goes down some 15 feet deep. Note that it’s very dank, slimy, very moist, and if a nice neighbor hadn’t offered to let me borrow his hip waders, my feet would have been a bit cold and wet. 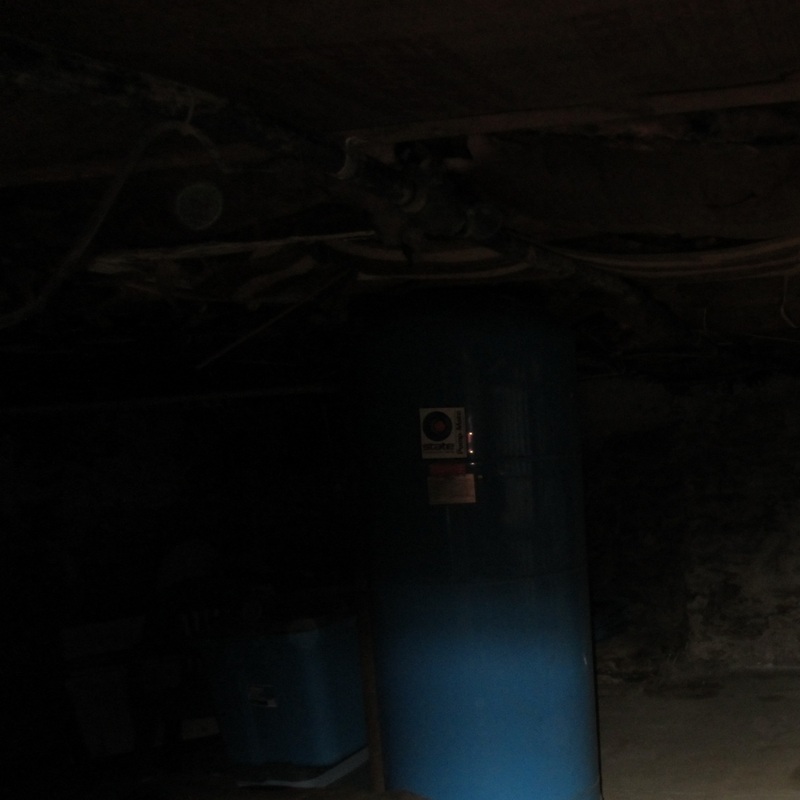 The next picture shows another shot of this dark cistern, but I had lowered a very powerful light into it to work by. I was going down with a garden rake and was going to dredge up anything of value. Now I know there isn’t a privy or old dump digger who wouldn’t pass on this opportunity. But, it was all for naught. All that I was able to dredge up were some old bricks and mortar pieces, not a bottle to be had. Win some, lose some, but you can’t just not go and find out. It’s all about exploring and discovery. What I Really Discovered in the Cistern. What I did discover what definitely not what I was looking for down there. While down dredging away with the rake and reaching into the muck with my bare hands very carefully groping for bottles. My landlord was working elsewhere on the property and stopped by to see how I was doing. I told him no bottles, just some bricks and mortar pieces on the capped bottom. 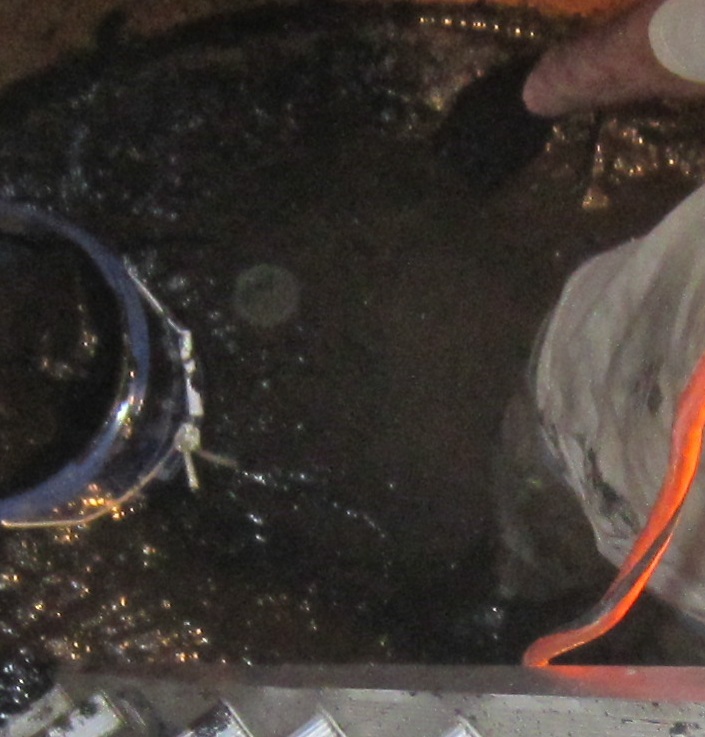 I then asked him to grab my camera sitting on the pump stand table and snap a couple of pictures of me down there, thinking my bottle friends on Facebook would get a kick out of seeing me down in the nasty, smelly muck having a go at finding something. He took three pictures, all are identical except the first one, featured below. To me, this is the most interesting photograph out of all I have shown in this article. You don’t see it? Look between my mucky black hand and the bucket. Yes, there is one there. A dust mote? Down there in the wet, slimy, cistern? There were two more identical pictures taken after, but this was the first one taken and it only appears in this photograph. This, I found, can be explained by simple physics; having had the pumped the water out, what would then enter to fill the void? Air. And what does air have plenty of? Airborne particles of course. Below is a cropped close detail. 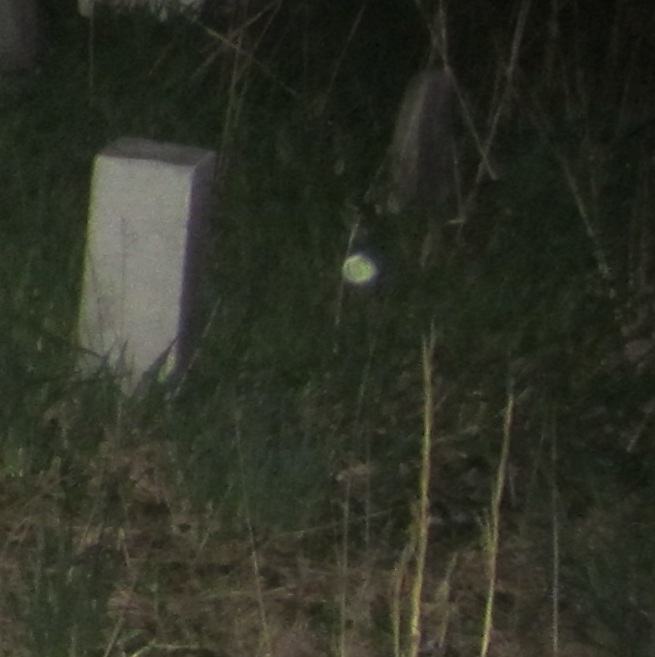 It’s easy to simply read something on the internet and think with all the information, these could be “Orbs,” as ghosthunters might want them to be, (myself included at first.) But, there’s a difference between simply reading information and the wisdom of actually experiencing something and then really knowing. It was time for another experiment, in another place and to settle this “Dusty” matter once and for all. April 26th, 9:45 PM. 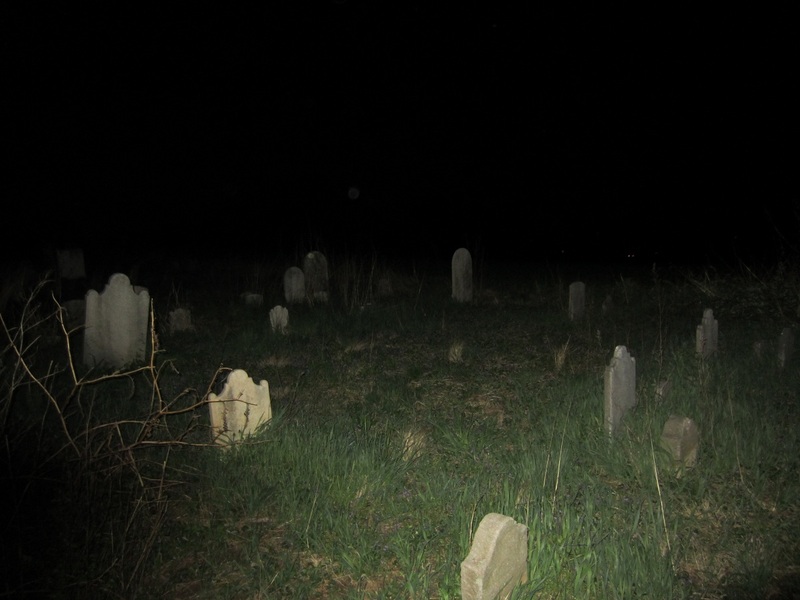 1820-1880’s Cemetery. I decided to have another fun go at checking out a cemetery a simple walk down the road from me. This time it was a full moon, there was very little wind, barely a breeze. I thought these different conditions would make for some interesting photographs. 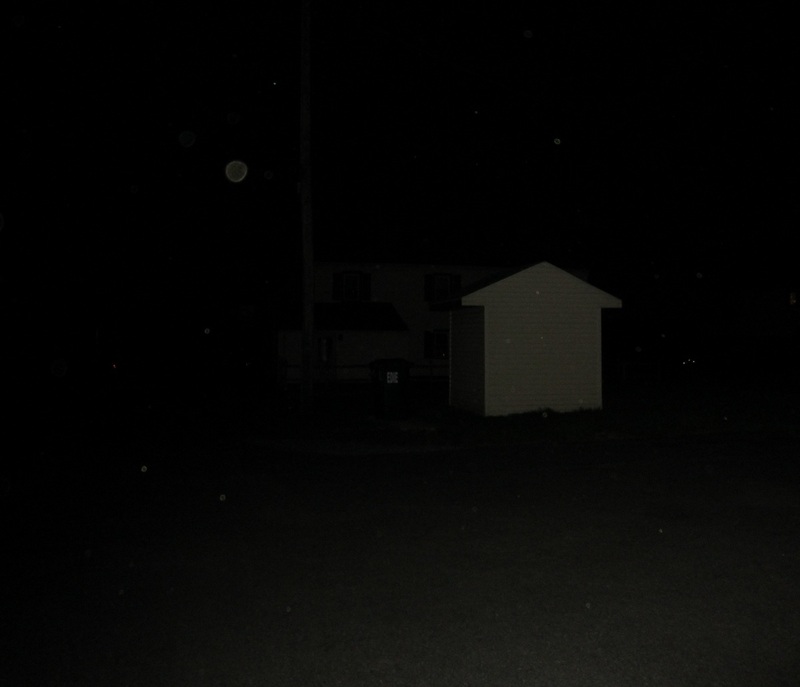 I also found that my camera has a setting for a flash with a slower shutter speed, which allowed more light in a night time shot. I took quite a few sample photographs, and in most, if not all, something did show up in them. 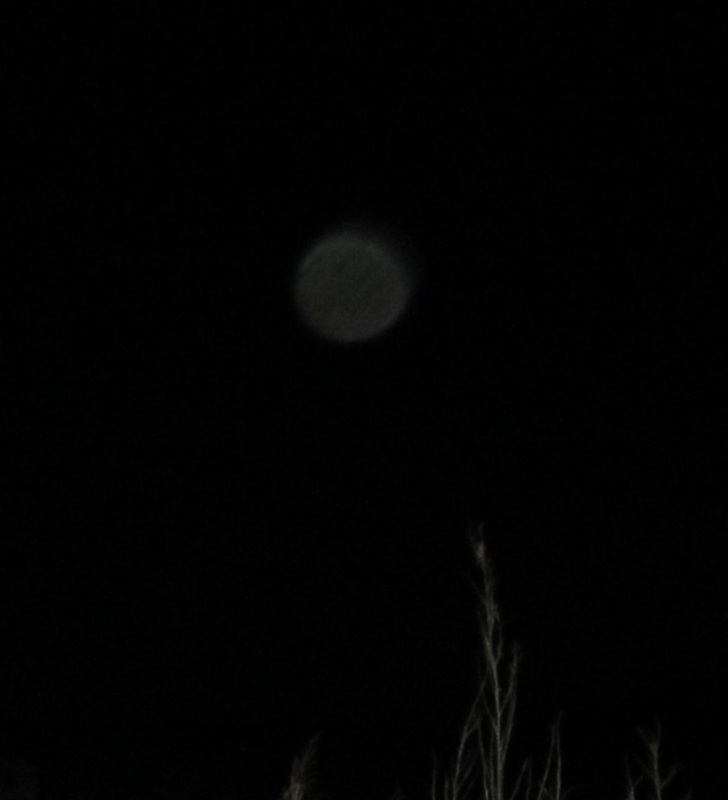 I found that with little or no wind, airborne particles are much more visible to a digital camera. Wow, look at that. 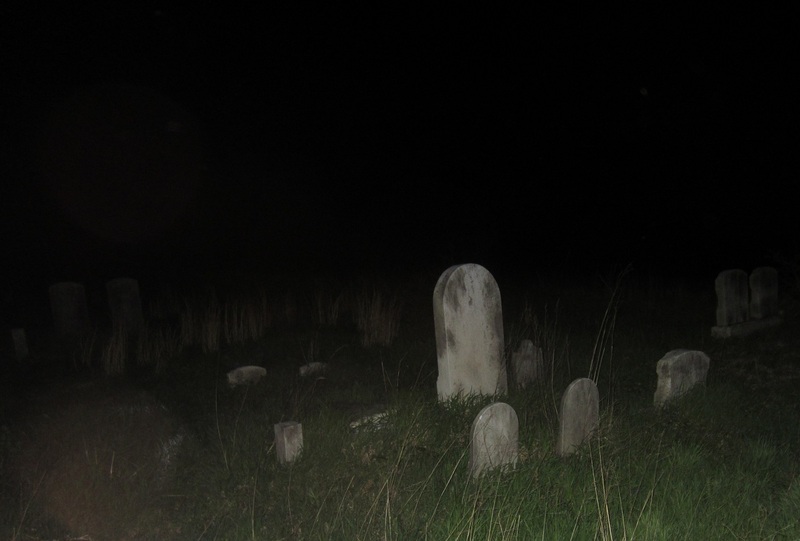 This is a small plot and there’s more “Ghosts” than graves. 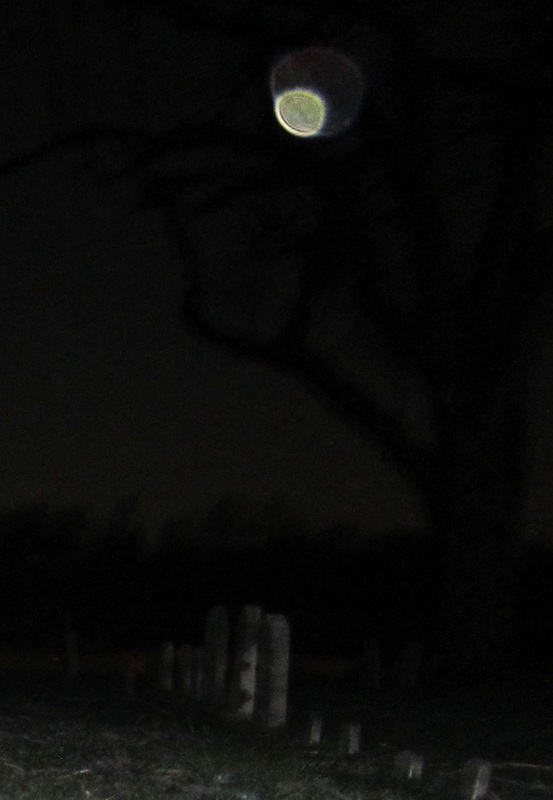 Interesting that there are more here than the older cemetery, but again, there was little or no wind this evening. The photographs are literally filled with these simple, yet fascinating dust motes or airborne particles. Some can appear very bright, while others remain transparent. 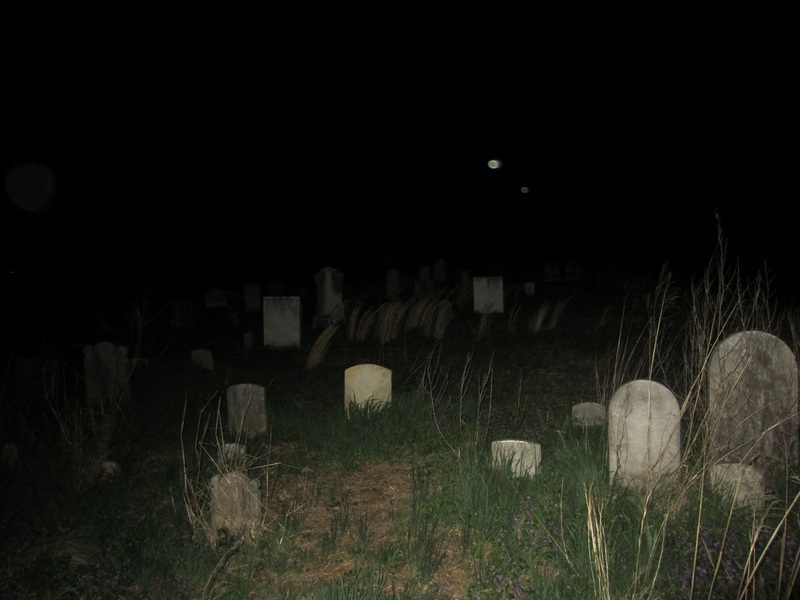 Quite a neat old cemetery, and again, even for a logical minded person, it’ still a bit creepy seeing these photographs even knowing these are not ghosts or apparitions. Above is a double superimposed example that looks like a eerie eyeball. On a still night this place was a treasure trove of these dusty particles. 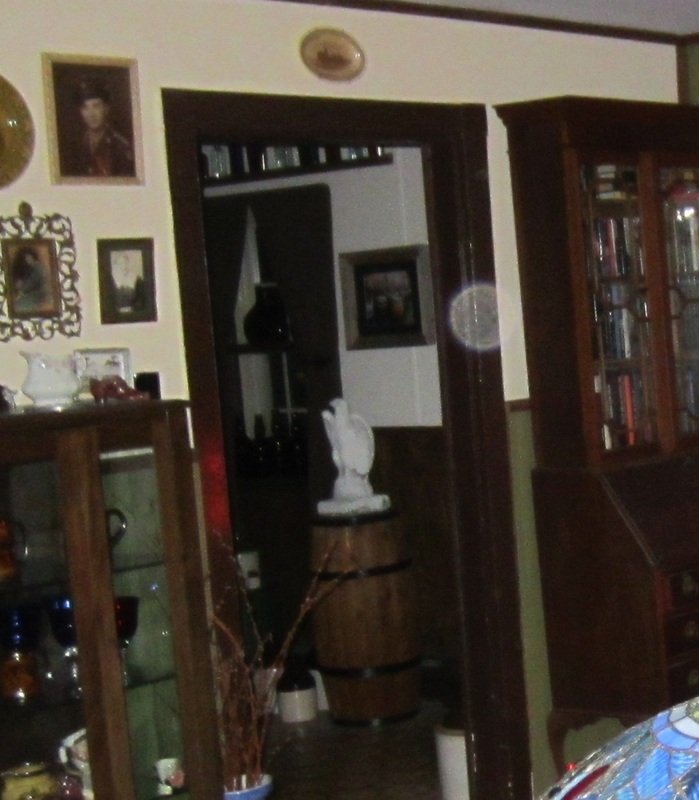 Though not true apparitions, I do find these pictures have a certain appeal to them. 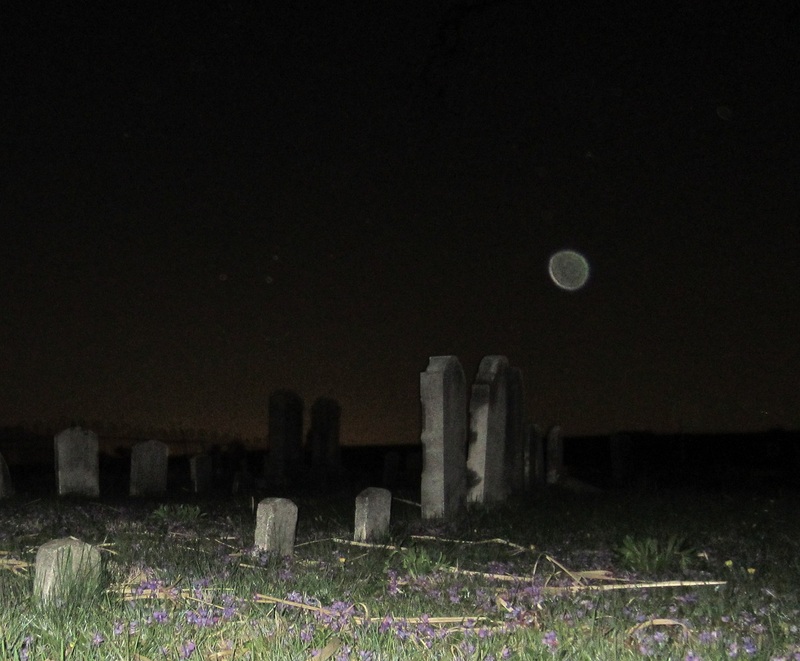 So, the argument between ghostly or paranormal orb and dust mote is settled. Yes, there was even one in my parlor at the old farmhouse. It’s just time for a little spring cleaning.